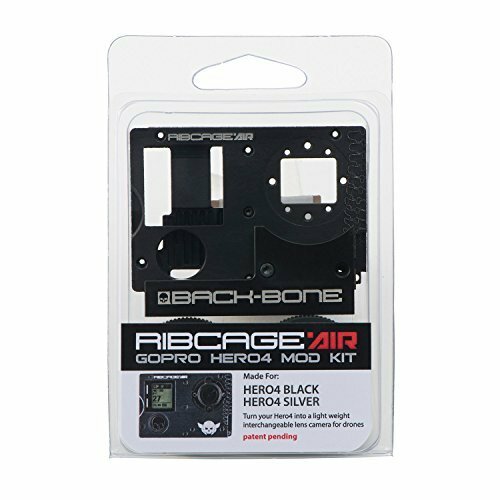 RIBCAGE AIR HERO4 MOD KIT: Do it yourself if you like to tinker! Install Back-Bone’s custom, all aluminum Ribcage AIR mod kit on any GoPro Hero4 Silver or Black (not included). Your camera will then be able to take micro M12, CS-Mount or C-Mount lenses. Designed for small UAVs and GoPro stabilizers the Ribcage AIR was built specifically to fit the 3DR Solo gimbal! Our premium machined aluminum plates are 50% lighter than our standard Ribcage Hero4 Mod. Detailed step by step video instructions. Note: CS and C-Mount lenses are not recommended for use on Solo or any other small GoPro gimbal. Ribcage Air GoPro HERO4 Modification Kit – Do it yourself if you like to tinker! Designed for small UAVs and GoPro stabilizers the Ribcage AIR was built specifically to fit the 3DR Solo gimbal! Our premium machined aluminum plates are 50% lighter than our standard Ribcage Hero4 Mod. Copyright © 2019 Texas TR. Powered by WordPress. Theme: Spacious by ThemeGrill.